The World Cup, the biggest sports event on the planet, is underway! And because I’ve always wanted to do a sports-themed blog post, I’ve compared the “world cup” SERPs for five different search engines to see what information they present and how. When you search for ‘world cup’ in Google, the top of the SERP consists of the results of the last few matches played, and an overview of the upcoming matches. The matches played have links pointing to recap articles on the FIFA site. Below this list there are links to the FIFA.com homepage, the World Cup schedule, current standings and the overview of the England team – Google after all knows where I am, never mind that England is not the UK and the Northern Irish don’t have any particular reason to cheer for the England squad. But we’ve all come to understand that American search companies have great difficulty coming to grips with the intricacies of European nationalities and cultures. Then follow a set of News results for the ‘world cup’ keyword. The first organic result after this is the FIFA homepage, followed by the Wikipedia article on the World Cup. 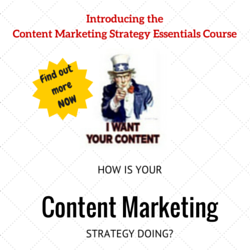 All in all a good SERP presenting relevant and useful information in a clear and well-structured manner. Additionally Google featured a World Cup doodle recently, and has launched a World Cup subsite where you can download Chrome extensions and iGoogle gadgets to follow your team. 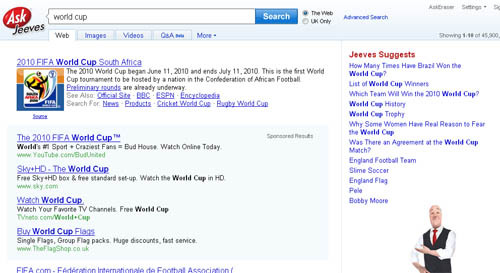 The ‘world cup’ SERP on Microsoft’s decision engine is a little more cluttered, with the top two spots taken by advertising. Below this there is a small box containing the upcoming match and the last played match. The links within this box either point to pages on FIFA.com or to further searches on Bing. The organic results are once again FIFA.com pages or Wikipedia pages. 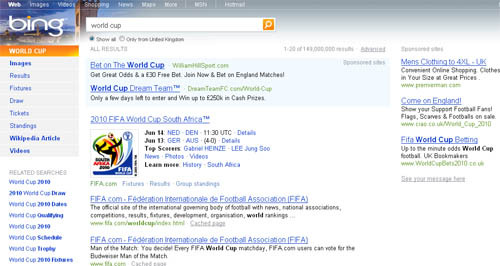 A set of image results is next, followed by results for related searches such as ‘world cup results’ and ‘world cup fixtures’. All together not bad, but not as neatly organised nor as instantly useful as Google’s SERP. Yahoo pulls out all the stops – after two sponsored results there’s a table of recently played games with links pointing to Yahoo’s Eurosport pages. Yahoo also knows where I am and shows me results for England and the Group C where England is a part of. 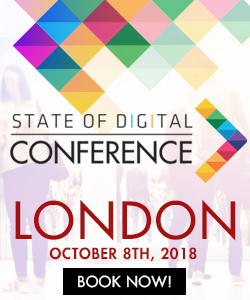 Up next is a plug for that monstrosity known as the Yahoo Toolbar, followed by organic results for FIFA.com with a lot of useful sitelinks. Also, the left sidebar contains a set of useful quick links to Wikipedia and news & sport sites. 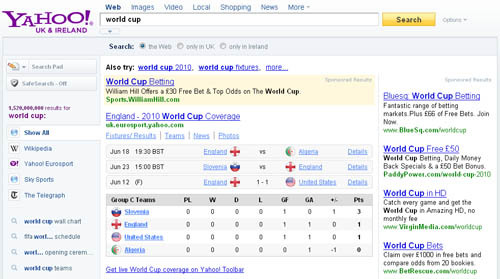 Yahoo has done a pretty good job with their ‘world cup’ SERPs. Jeeves presents me with links to various pages on the FIFA.com site, but there’s no table of upcoming matches or matches played. A set of sponsored results then breaks up the SERP, followed by another FIFA.com organic listing (complete with sitelinks) and then a box of TV listings. Jeeves suggests a few related searches in the right sidebar, some of which are pretty useful and fun. But all considered this is the weakest SERP so far. Russia’s answer to Google is devoid of all frills and thrills and gives me a simple organic SERP with FIFA.com and Wikipedia once again topping the list. It’s as pure a SERP as I’ve seen and the search-purist in me is totally wooed by this clean, simple, and straightforward organic SERP. It does require additional clicks for me as a user to get where I want to, but it doesn’t try to keep me on the SERP any longer than is necessary. 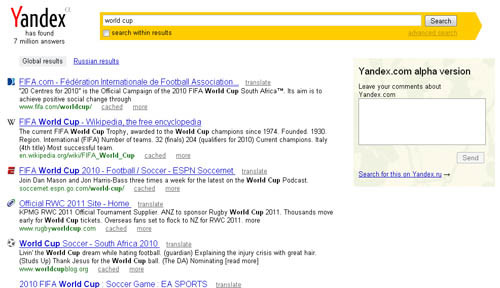 Google wins this battle of the World Cup SERPs with ease, though a runner-up is a more difficult choice. The purist in me wants to pick Yandex, even though this requires a user to click a few times more before getting the info being sought. Bing’s effort is commendable, but Yahoo’s is better with more relevant information presented in a nicer format. Ask.com is definitely the loser here with no real added value to its SERP, only distractions.